To thank the world's teachers during Teacher Appreciation Week from May 3-7, we're opening up all six of our PreK-6 Learning A-Z websites — for free. Sites include Reading A-Z, Raz-Kids, Writing A-Z, Science A-Z, Vocabulary A-Z, and Reading-Tutors. Nearly 50,000 teachers took advantage of our Open House last year and pre-registration for this year is now open. Just go to http://www.learninga-z.com/openhouse — and then pass it on to your friends and colleagues! My daughter asked me to check out Shopping City game at HoodaMath.com, and so I did. Well, I became hooked... it's one of those "addictive" types of games. I spent nearly a week playing it every day, until I was able to finish all 9 levels. I decided to write this blogpost about the gameplay because in the end, to be able to finish the last level, I had to do some serious analyzing of various factors in the game, which definitely reminds me of solving and analyzing math problems. On each level, you are shown an empty street map, and your task is to build stores and to earn a certain amount of money in a given amount of days. As the levels progress, the street map gets more complex, you have a bigger goal to achieve and more days to do it. In the last level, you need to earn a million dollars in 29 days. Then once you start the game, people start walking in from various directions, visiting the shops, and spending their money. Please read more, and see free sample pages. Math Mammoth Fractions & Decimals 3 continues the study of fraction and decimal topics, on the 6th grade level. This book assumes the student already has studied fractions and decimals in the past, for example using Math Mammoth Fractions 2 and Math Mammoth Decimals 2. The goal of the book is to go through all of the fraction and decimal arithmetic, using up to six decimal digits and larger denominators in fractions than what is commonly encountered in 4th and 5th grade materials. Read more, and see free sample pages. Please check out Math Teachers at Play #25! If you'd like to purchase a printed version of any of Math Mammoth books at Lulu, use the coupon code FREEMAIL305 to get $3.99 off the shipping charge (that is the shipping charge for one single book within the US). Only applicable for US addresses. Offer expires May 1, 2010. The two videos below show how you could teach multi-digit multiplication, or the multiplication algorithm, or multiplying in columns to students. 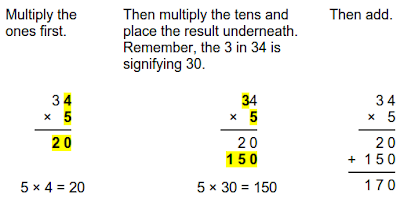 1) Teach students to multiply single-digit numbers by whole tens and hundreds. 3) Use the above as a stepping stone and teach the usual multiplication algorithm. 4) Teach the partial products again. 5) Teach the regular form of the algorithm. Step 1. This means teaching students to multiply 5 × 80 or 7 × 400 or 3 × 40 or 9 × 900 (mentally!). The shortcut is to multiply without the zero or zeros, then tag the zero or zeros to the result. At HomeschoolMath.net, you can now make free worksheets for place value & scientific notation (such as write a number in expanded form or in scientific notation), and also for proportions, including simple proportion word problems.